In 1987 FN developed the first experimental rounds for the P90 sub-machinegun. These first cartridges were made from necked down .30 M1 cases. Several experiments were conducted with different types and loadings and cases, but finally FN came up with the SS90 ball round. penetration of an U.S. helmet at 150m, a NATO armour plate at 30m, and the perforation of body armour (48 layers of Kevlar) at over 50m. 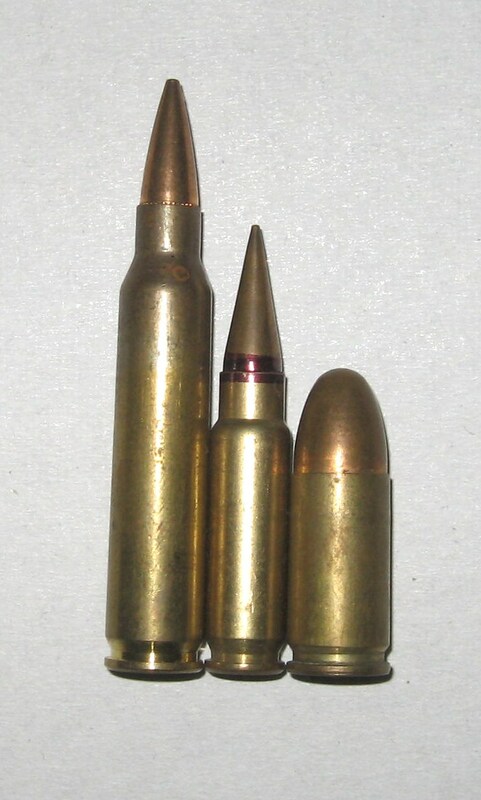 Based on these ballistic values, the SS90 round is positioned between the .223 and 9mmx19 NATO round. In the early 90s the bullet design was slightly changed to decrease the overall length of the SS90. The round was to long to use in the handgun (Five-SeveN). The second generation ammunition for the P90 weapon system was also produced in a wide range of different loadings. SS190, the ball round with an overall length of 40.5mm and a bullet weight of 31 grains. Sb 193, sub-sonic round. This round was designed for silenced P90s. the Sb 193 is identified by a white bullet tip. L 191, the tracer round, identified by a red bullet tip. These and other variations can be found in the image gallery. The ballistics of the SS190 is more or less the same as the SS90 round.